esoteric – Steampunk – Shrunk! In every job lot of second hand dolls I source, there are treasures and trash. At first sight, Daniella fell into the latter category. Her head was far too large for her body and limbs, her legs and minuscule feet were loose and badly made, her oversized clothes crudely glued on, her hair matted and messy and the face looked sullen. What sort of transformation could I exact on her? We stared balefully at one another for a considerable time and eventually I knew. I have a friend who does psychic card readings in a little booth. She wears glittering shawls, scarves and jewels in reds and purples with plenty of black eye makeup. She was my inspiration. Next I remembered those booths you used to get on seaside piers or in dark corners of amusement parks with a life-sized mannequin head and upper body. You put your money in the slot, the mannequin jiggled about a bit and stared into a crystal ball, lights shone eerily and a card displaying your fortune emerged from a space below. That was what Daniella would be! Off came the clothes and hair. A delicate paint job transformed the face from sulky to inscrutable and exotic. A sleek black wig, silver, purple and scarlet shawls and large hooped earrings were added. The legs and lower torso were glued into a cardboard tube and I set about making her booth. A domed lantern at the top, concealed at the front with the Fortune Teller sign, holds a Halloween finger light, painted purple to illuminate the booth. Daniella sits in a curtained section with a crystal ball made from a bead, a window and a slot for one penny to be inserted. The rest of the box is decorated with diminutive tarot cards and other esoteric images, along with an aperture for the fortune card to be released. There is even a lever at the back which can be moved, allowing the mannequin to shift about slightly as she considers your future. My little fortune teller will accompany me to various steampunk conventions and sales throughout the spring and summer, until she’s snapped up and taken to read fortunes for some lucky customer. She’s already packed and ready to attend the Shrewsbury Steampunk Spectacular on March 24th and 25th in St Marys Church. Should the contents of this ancient tome be made public? We sincerely doubt it. People approach our sales area, lovingly handle copies of the book and purchase it. Since it measures only one inch from top to bottom, though, they are incapable of reading the text, so all remains well. However we have been prevailed upon to make the book’s contents generally available and – with more than a few reservations – have agreed to do so. The covers and most illustrations are by a singularly talented lady called Betsy, who virtually resides at Chocolate Rabbit. If you click here you can visit her shop. The text is ancient and handed down through the ages but compiled many hundreds of years ago by Messrs Aubrey and Dee. A few copies have recently surfaced and can be purchased via Steampunk – Shrunk. This being hopefully too small to be viewed with the naked eye, it is to be hoped that what follows will not be taken in too literal a sense by any readers, since following these recipes could result in all manner of foul and unpleasant effects, which could render the reader or his subject insensible or possibly deceased. The second reason for keeping to this miniscule size is that we can’t spare the time to write an entire book on a subject of which our knowledge is sadly lacking in any case. Some preliminary notes on the Philosophers’ Stone. Should the apostrophe come before or after the s there? We are not entirely sure whether we speak here of one or multiple philosophers. Certainly it may be the case that the esteemed authors of this tome were able to conjure this miraculous substance, but we are not telling. How stupid do you think we are? History will be able to judge whether or not we have been successful in our attempt to discover the source of eternal youth. Should this volume be published posthumously, or read in a time when one or both is no longer incarnate, then the reader may judge for himself our lack of success in this area. So anyway, we digress. Let us set out a simple recipe for the preparation of the substance you require. Easy as making scrambled eggs, honestly. Take equal parts of blood from a recently slaughtered beast – sorry vegetarians and vegans, we’ve lost you already. Anyway, as we said, blood, mixed with equal parts of phosphorous, zinc, yellow sulphur and spirits of aqua vitae. The stench will be beyond your wildest imaginings and will reduce grown men to tears and fits of the vapours. Nevertheless, it is vital to persevere. Perhaps placing a handkerchief or a nosegay of country herbs close to your nose will be of some assistance. We sincerely doubt it. We suspect this will be about a useful as it was in preventing individuals from catching the plague. Once you have your mixture, it must be distilled at least three times. We’re assuming you have access to a still. If not, why on earth are you bothering to read this book? Honestly – amateurs. We have no regard for such people. After the distillation process, you will be left with a clear substance the colour of dark urine. To this, add an equal quantity of – you guessed it – dark urine. This should preferably be collected from a virgin at full moon. However, in our experience, such ladies seem strangely reticent to provide said liquid to honest students of natural science and you may find you have to use your own, or pay the young woman handsomely for the substance. Next the mixture must be left to putrefy for at least seven weeks. You will probably find, as we did, that long before this time has elapsed, you will have been evicted from your lodgings and all neighbours within a hundred yard radius will have fled to the countryside, since the odour is rather pungent. Persevere, dear reader. You are inching ever closer to the miraculous substance you wish to produce. The next stage is to obtain one dozen of the finest hens’ eggs, as freshly laid as may be. Break the eggs into a bowl and do with them as you will. This might be a good time to make those scrambled eggs we mentioned earlier. Now retrieve all the eggshells you have just cast upon your midden or added to your recycling bin (depending on the era in which you are reading this). Place in a mortar – or is it a pestle? Never really figured out which bit was which. Anyhow, put them in the bowl-shaped one and pound them vigorously with the other thing. When they are well smashed, add to them 4 drams of camphor. Continue to pound vigorously, or simply stick the whole mess in the blender if you have one. We’re giving ourselves away a bit here, aren’t we? I think you’ve probably rumbled us by now. Either this book is an elaborate hoax or we stumbled upon the secrets of time travel and have visited the XX1 century. Since you don’t know which, though, you’ll just have to keep reading. Now since this book – which no one will be able to read in any case – is taking an inordinate amount of time to write, we will now do some judicious cutting and pasting. Kindly pass me the dagger and a pot of the boiled calves’ foot glue, Mr Aubrey, if you’d be so kind. As you will doubtless have gathered, that was a rather longwinded way of saying you need to repeat the initial process. You now have two vats of very smelly liquid and one of almost as smelly powder. The next step is to combine all of these in a large iron cauldron. This must then be heated over a fire, stirring continuously for the first fifteen hours. After that, leave it to simmer until all the liquid has evaporated and you are left with a blackened crust at the bottom of the cauldron. This must be scraped from the vessel and pounded. We do like a good bit of pounding. We suggest mixing this with half a jar of Modge Podge. This is a wondrous substance available in the XX1 century and does the job like no other. Congratulations. Once it has set, you will have your very own philosopher’s or philosophers’ stone. As you will see in the illustration, you will now be able to grow an extra head and stand atop a fire-breathing dragon with total impunity. This is obviously the real reason you purchased this volume. That [illustration – you’d need to buy the book to see it] is a very lame attempt to make this look vaguely mathematical, but since you won’t be able to read it (and nor will the guy we lifted the page from) there’s no harm in it really and we have almost half a book to fill. Basically, time is no more than a convenient form of measurement. We are accustomed to using it in one direction only, from past, through the present and towards an uncertain and – as most common people believe – unknowable future. However there is far more to time than that. If you are in doubt, we suggest a visit to Old Mother Hambledon at the third cottage after the gallows on Black Heath Common. Half an hour in the company of this good woman will convince you of one of two things – either that time is quite capable of standing still, since half an hour in her company is equivalent to several days in the company of any other, or – should she be having one of her good days – that she is capable of seeing into the future as easily as you can see this book in front of your face. Once it has become apparent to you that time can be – let us say – manipulated, you will be eager to experiment further. It would be tempting to explore metaphysics at this point and talk some real sense, as we have in fact performed some fascinating experiments in this area. This is, however a grimoire, and as such, you will be expecting a set of arcane charms, spells and other superstitious twaddle. Far be it from us to disappoint a willing audience. We get royalties on this book. They are derisory, of course, but nevertheless, they keep the banshees, hobgoblins and other nasties from the door. So, a spell you will get. Pulverise and mix all the ingredients, then heat in your cauldron. It may be advisable to wash out the cauldron if you have recently prepared the philosopher’s or philosophers’ stone. Please note, in this volume we use Roman numerals. It is an ancient grimoire, after all. We are just slightly concerned that some readers may have read the recipe as one hundred and eleven mushrooms, as opposed to three. Believe us, three will be plenty. Anyway, back to the spell. Stir the mixture seventy-five times widdershins by a waning moon. Yes, we admit it. Another cut and paste job. It’s getting late. Imbibe as much as you can without vomiting too profusely and remain seated. If you have followed the recipe exactly, you will find your head begins to spin. No, that wasn’t figurative. We mean it. You will then find yourself rising into the aether and experiencing life in a very different time frame to the one you normally inhabit. Do not be overly alarmed, unless of course you find yourself in a particularly alarming period of the past or future. In which case, feel free to be as alarmed as seems prudent. The effects of the potion will wear off at some point, but not – naturally – a point in time, since you have traversed that medium, remember? We hope you find the experience as edifying and instructive as you wish it to be. There are a few side effects, so if you should experience nausea, dizziness, ringing in the ears, or any other appendage, don’t attempt litigation. We – remember – are highly experienced time travellers and you will never catch up with us. Every spell book has one of these. We have no idea why. What’s the problem with warts anyway? Surely a charm to cure smallpox or world poverty or something would be far more useful, but our editor insisted. “Give them a wart spell, boys,” he told us, and who are we to argue? Begone thou warty and mendicant wart. As thou offendst mine eyen. Or a rampaging hedgehog or badger. So long as thou leavest me in peace. I trust thou hast the message by now. Begone thou foul and loathly wart. If that doesn’t do the trick, we are sorry to say that you are stuck with the wart. But hey, it could be a plague of boils, so really, just be happy with your lot. We hope you have enjoyed our grimoire. Do visit our Amazon page if you ever find yourself in a time when such things exist. Illustrated copies of the Grimoire are available From Steampunk – Shrunk at £4.50 each and can be shipped for the cost of a large letter. Please use the contact form on our home page. This is a limited edition of 99 books and each is individually compiled and aged by hand. Vell I ask you, if you were to come into possession of an ancient grimoire vhich contained (along wiz ze normal recipes for creating ze philosophers’ stone und cures for varts) a spell entitled ‘How to Traverse Time’, vouldn’t you be a little intrigued? Vouldn’t you give up a successful career to explore ze secrets it offers? Of course you vould. Just as I did. I had a huge laboratory, back in zose days. Mechanical construction vas my bread-und-butter. Alvays zer ver young men vanting automatons, adjustments to zer contraptions and votnots. Fraulein Vorzington, my young assistant, vas quite excellent at such sings. I left her to it. For me, reading ancient texts vas far more important. I had zis strong feeling zat vun day, I vould discover zat for vich I searched. Und here it is – ein dusty old volume, standing on my small table in my tiny, dark garret. Viz zis book, I vill conquer time itself! The Case of the Alchemist’s Study will be on display on my stall at the Glastonbury Craft and Vintage Fair on Saturday 29th April, 2017. 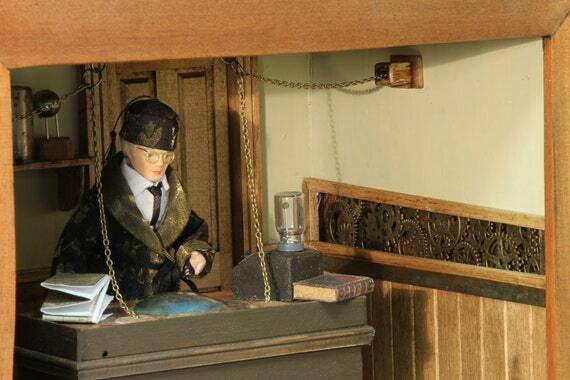 Other Steampunk – Shrunk figures, rooms and accessories are available at Rune Smith of Glastonbury, at 1 Monarch Way, off Glastonbury High Street and online at the Steampunk Dolls’ House (where you can find Dr Kopp’s erstwhile assistant, Lucy Worthington and one of her automatons). The jar labels, posters and cover for the spell book are courtesy of the wonderful Betsy at Chocolate Rabbit Graphics. As promised, the first of the steampunk-themed rooms has now joined the items for sale at the Steampunk Dolls House shop on Etsy UK. 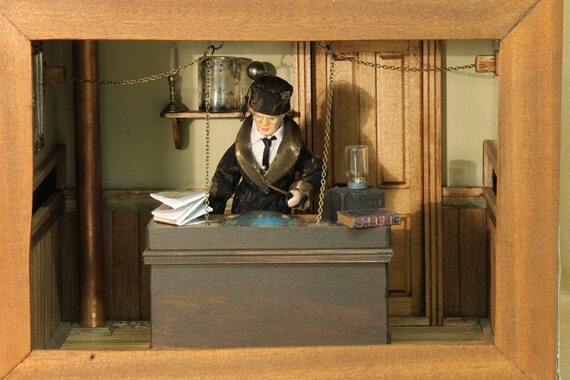 Professor Erasmus, in his black and gold smoking jacket and cap, stands, deep in thought, staring into the domed scrying glass set into his bench. Ancient books, contraptions and receptacles of various kinds surround him or lie on shelf behind him. An elaborate system of chains and pulleys hang from the ceiling and above the wooden wall panelling, the cogs that control various clockwork mechanisms can be glimpsed. There are several other images and more details available on the site. The scrying room was created by Matt, the shop’s owner, while Erasmus was made here in my workshop, to Matt’s specifications. I’m currently working on a series of framed portraits of the shop’s characters, with help from the ‘effects’ button on my phone. These should be available in the shop soon. Here is a sepia toned photograph of Erazmus, to give you an idea of how they will look. You can find full details of the scrying room by clicking here. Maybe I’m biased, but I think, considering the hours of work and craftsmanship that went into it, it’s very underpriced. See what you think.